If you are buying real estate that has a septic system, we can perform a pre-buy video inspection to assure you of the condition of the septic system and main lines. 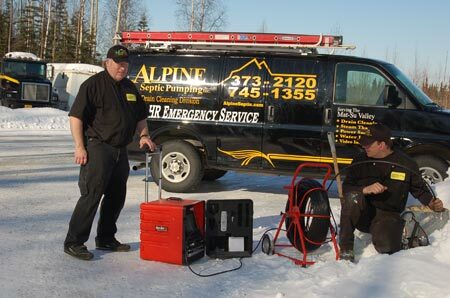 Alpine Septic Pumping – Drain Cleaning Division has modern video inspection equipment needed to do a thorough inspection of septic drain pipes or sewer. Video inspection can help determine the condition of your pipes, if septic tank baffle is impacted, or if repairs need to be done to to the septic or sewer to prevent further backup problems. The inspection is accomplished by placing a video snake camera into a drain clean-out or other access point, as the camera advances the operator narrates what they see onto a DVD recording of the inspection. The DVD can then be reviewed by the property owner with the help of the technician to determine what, if any, repairs are needed and to develop a course of action to get the longest life possible out of a septic system. Alpine Septic has all the equipment and expertise to locate underground non-electrical pipes using a special function of the in-line video camera. Alpine can plot position and depth of pipes with access large enough for the snake camera to fit into. An inspection of your pipes and drains before excavation can save you thousands by pinpointing the exact location before you dig. Call us today to make an appointment to have our crew visit your location for a sewer line or pipe inspection.